Crofts Estate Agents are delighted to market this three bedroom semi detached family home which benefits from having off road parking to the front and a rear garage. The house is located in a popular residential area of Immingham and it has been priced to attract buyers. The ground floor comprises of the entrance hallway, W/C, front lounge, dining room and kitchen. There are also a couple of storage cupboards just off the kitchen. The first floor has two double bedrooms plus a single room. The family bathroom has a three piece suite which includes a bath, wash basin and toilet. To the rear there is a generous sized garden which has a garage, ideal for storage. Viewings are available immediately. To the front you will find a bricked wall and iron gates which lead onto the front driveway. This provides off road parking for potentially two cars. The drive then continues down the side of the house until you reach the back garden and the garage. Located to the front of the property, the lounge has a large uPVC double glazed window to the front of the room which provides an excellent amount of light into the space. The decor is neutral throughout and it then opens up via the open plan dining room. The dining room is an open plan space which is accessed via the lounge. The room is neutral in decor and has uPVC french doors opening out onto the back garden. The kitchen is a really good sized room and has a range of wall and base units which provide excellent storage and worktop space. There is a large rear uPVC window which looks out onto the back garden, this also brings in lots of daylight. Just off the kitchen you will find a couple of storage cupboards, one for general storage, the other acting as a pantry. Just as you enter the property via the front door, you will see a door way just inside the hallway. This leads into the W/C. In here you will find the gas central heated boiler plus the downstairs toilet. The first of the bedrooms is a double sized room located to the rear of the house, this looks out onto the back garden which is a nice outlook. The second of the bedrooms is another double sized room which is located to the front of the first floor, this room looks out onto the front garden. 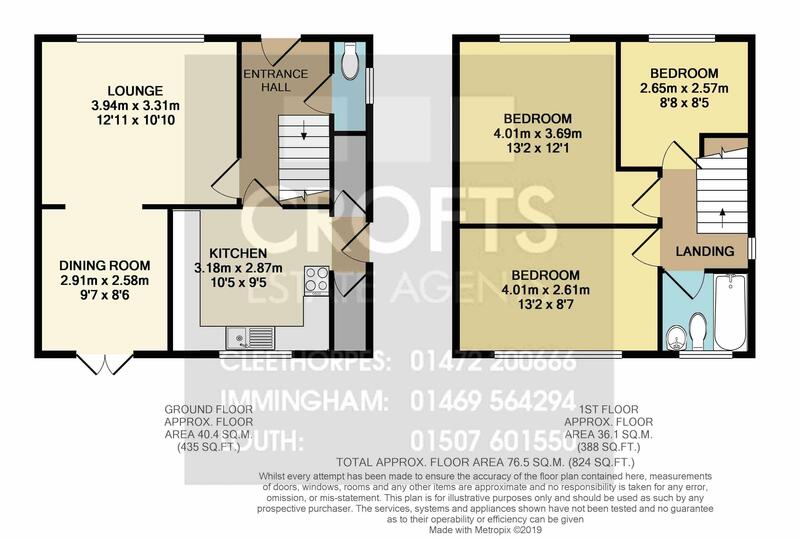 The third bedroom is located to the front of the first floor and is the smallest of the three bedrooms. There is a front uPVC window and plenty of space for a single bedroom and chest of drawers etc. The bathroom is located at the top of the landing area and provides the house with a three piece suite, which includes a bath shower, toilet and wash basin. The back garden is a really nice private outdoor space. There is a good sized garage and shed which both give excellent storage spaces to the property.